KMW Hygienic Level Switch for Liquids - HiTECH Technologies, Inc. 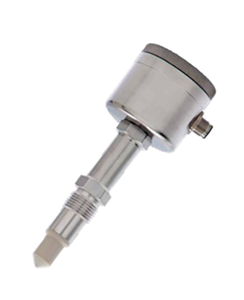 The hygienic level switch KMW is microprocessor based and can be installed in any position in tanks or piping systems. The measuring principle is an electromagnetic wave. A high frequency signal sweep is radiated from the sensor tip into the tank or pipe. The medium acts as a virtual capacitor. This virtual capacity will depend of the dielectric value of the medium and is well defined for most media. Therefore the KMW is suitable for almost all liquids and paste-like medias. There are 7 base settings for several medias. The KMW is suitable for almost all liquids and paste-like medias.